Then one wonderful day I met the man of my dreams. 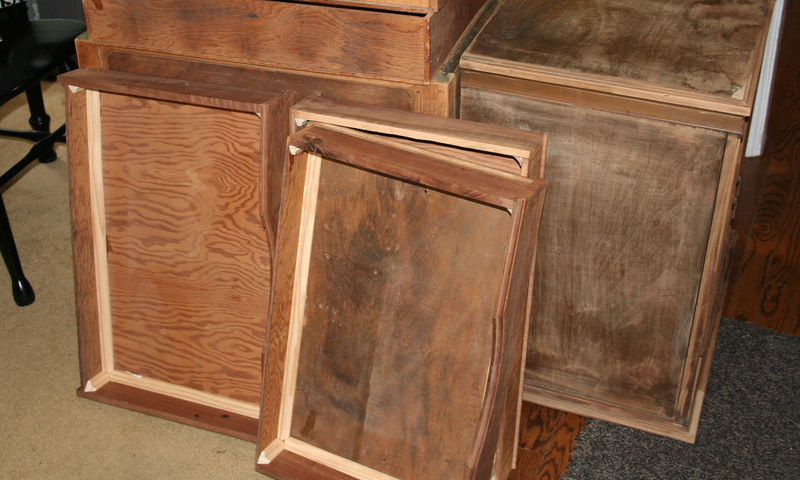 A man with a fabulous wood shop and 50 years of experience in woodworking. BEST "MEET" EVER! He was kind enough to help me through the extensive process of taking the whole thing apart, fixing the broken parts, replacing missing wood - basically doing whatever was necessary to make the cabinet function again. FYI - when I say "help me through the process" I mean he did the hard stuff and I did the easy stuff. This all took place pre-blog thoughts, so of course I have no pictures of any of that. This cabinet was very dirty so I sanded it quite a bit just to get the grime off. 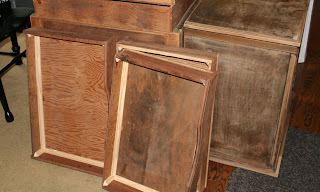 We reinforced the drawers by inserting trim pieces into all the seams of the drawers - nailed and glued. 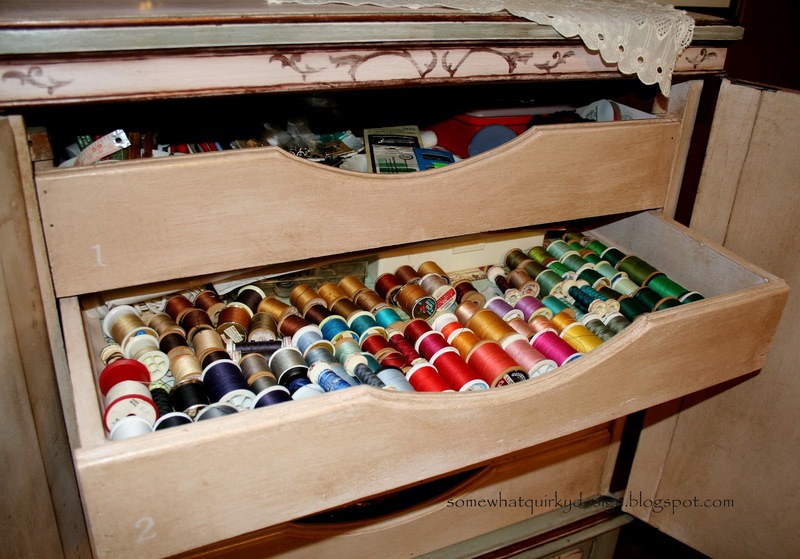 I never would have thought of this on my own - I would have just kept putting in nails here and there - but these drawers are sturdy suckers now! Painted two coats of pink paint from my paint stock - flat finish. 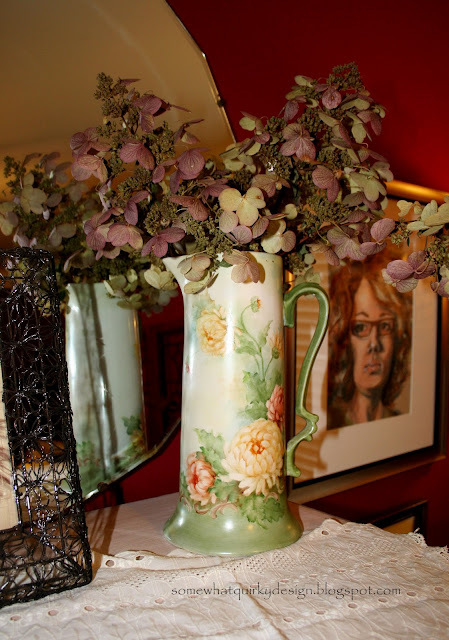 Used a large stencil I had on hand (from Hobby Lobby) to draw on the decorative painting pattern. I did not stencil this on because I was using bits and pieces of the stencil pattern and because the trim didn't allow for the flat surfaces needed for stenciling. Added the accent painting - green from paint stock and bronze acrylic - on the legs and cabinet. Filled in the decorative painting. Waxed with Walnut Briwax and Clear Minwax. Note: I wasn't really happy with the pink color so I used the dark wax first to alter the color as much a possible, I then had to remove a lot of the color with the clear wax, sanding, more clear wax, etc. Note#2: The acrylic bronze did not take the dark stain well because the nature of a metalic is to resist stain. I did not anticipate this. 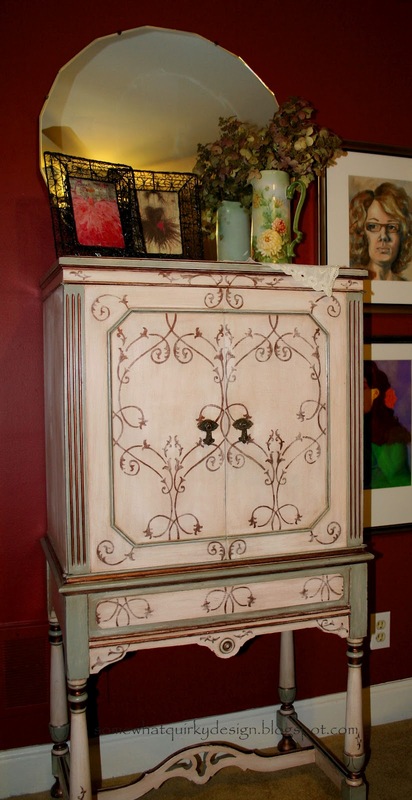 The more muted application of true stenciling would have been preferred on this piece. I had to do a lot of distressing to get even this close to the look I was going for. WAXED THE BOTTOM OF THE DRAWER EDGES AND DRAWER SUPPORTS IN THE CABINET. 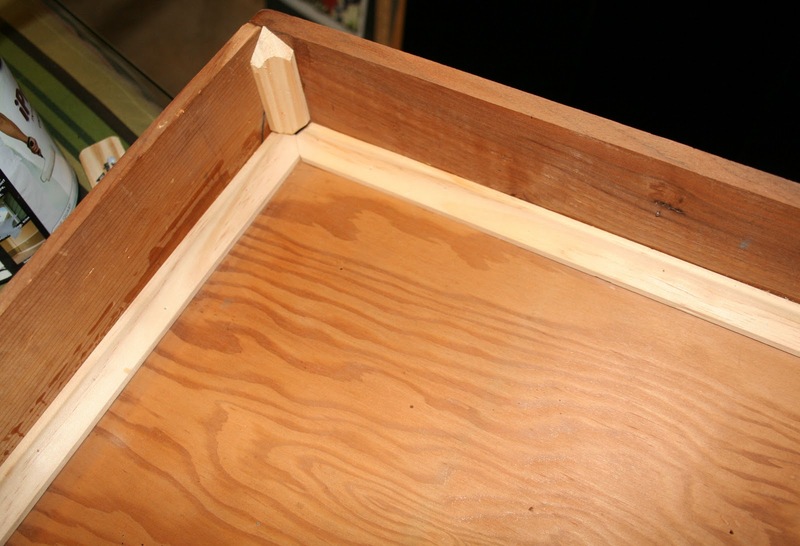 This should be done periodically for drawers that function without glides - when the wood slides on wood. These dried Quickfire Hydrangeas are an example of my hydrangea growing skills :)! Close up of accent painting. 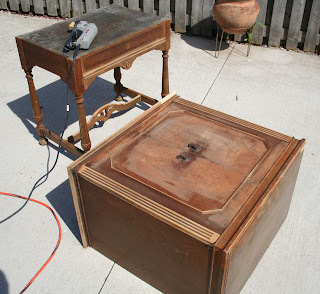 You can also see the distressing/waxing here. 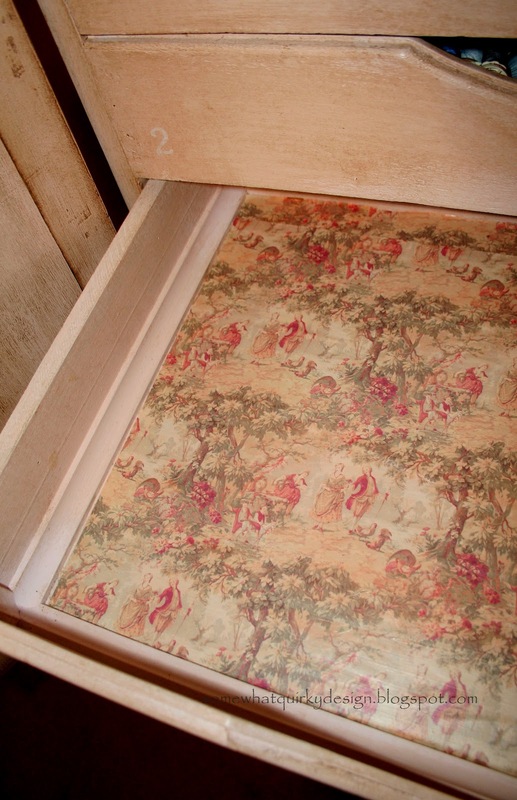 I lined the drawers with scrapbook paper applied with decoupage medium. On my "Happiness With Complete Projects" scale I rate this a 6. There are a lot of things I would do differently if I had it to do again. However, I love having this piece finished and usable - and that brings it up to an 8.5. Most important: I cherish having items and furniture that connect me to lovely talented people like Sue. When Mr. Quirky's family visits it means something to them, too. Awesome makeover. Love the lining. just beautiful! What a great piece! Thanks Laura. Just checked out your blog. You must be channeling me - I too crave wall to wall shelves - but I have kept my book craving in check up to this point. Love the turquoise dresser. I'm a bold color kind of girl. What a beautiful piece! You obviously put a lot of love and hard work into this hutch! 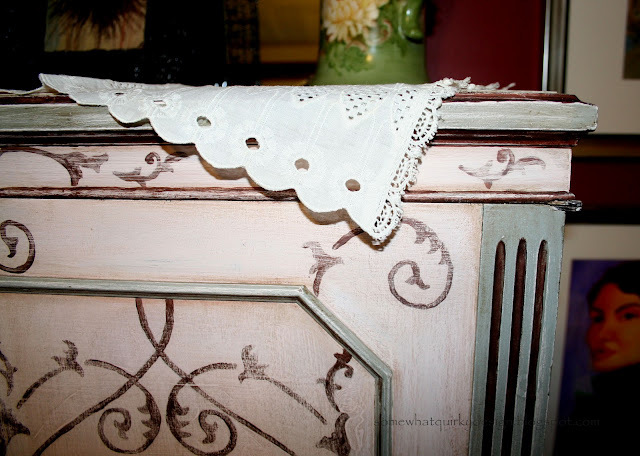 I love the stenciling...it just gave it that extra "wow" factor! Nicely done! Thanks Amanda. Funny - I was just admiring your vanity makeover this morning. I am envious. Thanks Val. I was reading on your blog about your trip to Botswana over the holidays. What a wonderful way to spend Christmas! I love that piece. IF you recall I included it in my post about you. I read this earlier and was left wondering why you would call him Mr. Quirky. I was thinking that wasn't very nice. I don't think he's quirky. Then later it hit me. Duh. The husband of somewhat quirky is Mr. Quirky. So funny!!! Jennifer and I got a big laugh out of this. Thanks for that! So sweet- love how it came out!! Thanks for sharing at Feathered Nest Friday! oh wow, that is one beautiful piece! i love it- and it is so useful, too! Karen, I just love this makeover. You did an awesome job! I'm working on a radio cabinet right now and you have so inspired me.